Have you ever found it a daunting task to find a decent hotel to stay at during a business or a leisurely trip? Typically, when looking for a place to stay or just crash for a night or two, we would visit sites like Tripadvisor and Hotels.com and end up reading reviews after reviews after reviews on these sites...only to find that we are going around in circles and getting confused along the way, trying to shortlist a few that actually fit the bill. 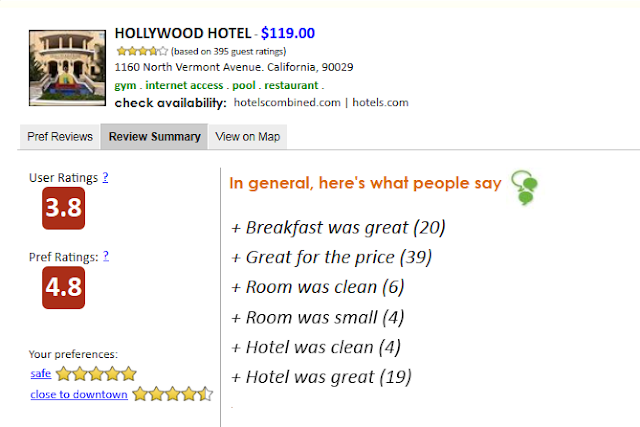 Not only is this a waste of time, it is hard to keep track of which hotel is good in which aspect. If you forget, you are back to square one...back to reading reviews all over again for that hotel. Bottom line: it can get quite messy. You can actually specify your pesonal criteria in the search box and what you get back are hotels that are said to be "safe" and "close to downtown". Notice that the preferences are actually natural keyword queries. So you can basically express anything you want. The hotels are ranked by how well it matches your preferences. For each ranked hotel, you have a breakdown of how well each of your preference is matched and also an overall score indicating how well this hotel matches all of your preferences. The review snippets for each preference allows you to confirm that the hotel is indeed what you are looking for. You can also view all the related reviews for each preference if you need more information or simply want to do your due diligence. Apart from all these cool features, FindiLike Hotel Search also has the standard features that allows you to view hotel information from various sources like Google Place Page and Hotels.com and you can also compare rates, filter by price and so on. Give it a try and see if you like it...give the team constructive feedback so that you see features that are really important to you in the near future.